Bricco Maiolica is a family owned estate that has been in the family for 4 generations. Bricco Maiolica is located in the heartland of the dolcetto grape Diano d’Alba and is now run by Beppe Accomo and his wife Claudia Castella. The Bricco Maiolica farm takes its name from the hill that is located. There are elevations reaching up to 450 meters and the vineyards are located on sloped land and comprised of limestone rich soil providing an ideal location for quality wine production. The annual production for the estate runs around 90k bottles on 21 hectares of land. The Bricco Maiolica success can be attributed to the attention that they give their vines, their soils and their location’s microclimate. Very low yields for all the varieties of grapes leads to healthy vines and optimum fruit. Though not certified organic they use neither chemical fungicides or mildew killers while natural fertilizers are the norm. All of the wines are made with hand harvested, estate grown grapes. 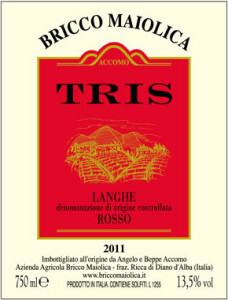 *Multiple Tre Bicchieri winning wine!! * 100% Nebbiolo grapes. 2 ha vineyard (about 8.000 bottles). Planted in 1983. Facing south–east (350–380 meters above sea level). Aged 18 months in French oak barrels Ruby coloured, with garnet red shades. Delicate bouquet, with hints of ripe fruits, liquorice and vanilla. Full flavour, balanced tannins, with hints of wood underneath. 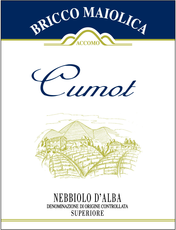 From the same vineyards which give birth to the highly sought after “Cumot” Nebbiolo, Bricco Maiolica created a young, elegant and soft wine for easy consumption. Aged in steel and wood for about ten months, it is then bottled in the July following its harvest. It matches with a simple cooking and it is suitable throughout the meal. ********************** Best served at 16/18°C, in order to appreciate the organoleptic characteristics related to the youth and the fragrance of the fruit . 100% Nebbiolo grapes. 3,5 ha “Cumot” vineyards (about 20.000 bottles). 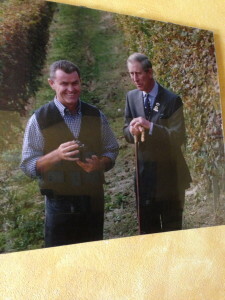 Planted in 1983 and 1995. Facing south-east (350 -380 metres above sea level). Ruby colored. Fruity bouquet with hints of raspberry, strawberry and red currant. Smooth flavour, fresh and delicate with mild tannins. A classic Dolcetto Diano d'Alba, with all the freshness of spring bottling. Let ageing for about 8 months in steel tanks it is an excellent wine for the whole meal: from hot hors-d’oeuvres to first courses (pasta, polenta, soups) and main courses of white meat. It is an ancient tradition to offer, as a snack, Dolcetto with salami and the tuma of Langa (a semi- ripened cheese made with ewe’s and goat’s milk). 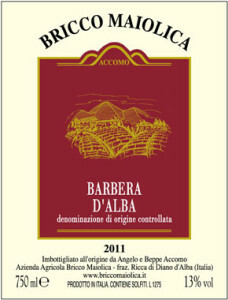 100% Dolcetto Diano d'Alba grapes. 3 ha vineyard (circa 20,000 bottles). Facing south-east (350-380 metres above sea level). Deep red coloured with violet shades. Fruity flavour with a pleasant almond aftertaste . 100% Barbera grapes. Traditional Barbera, with wild yeast fermentation this wine is aged only in steel tanks, for 10 months. It’s a very fruity wine with sensation of currant, blueberry, black cherry, plum and mulberry. This very velvety Barbera, characterized by little acidity, matches well with easy food (pizza, salami, barbecued meat) and soft unripe cheeses. Best served slightly cool, at 15/16°C, just uncorked. ************* 3 ha vineyard (about 15.000 bottles). Planted in 2003. Facing south - west (350 - 370 metres above sea level). Let ageing for 10 months in steel tanks. Ruby colored. Fruity bouquet with hints of red currant and nectarine. “Tris” is a blend [1/3 each] of Barbera, Dolcetto refined in steel tanks and Merlot which makes fermentation in tanks of the same kind and which ages for 9 months in 225L French oak barrels, used for the second and third time. 2 ha vineyard (about 10.000 bottles). 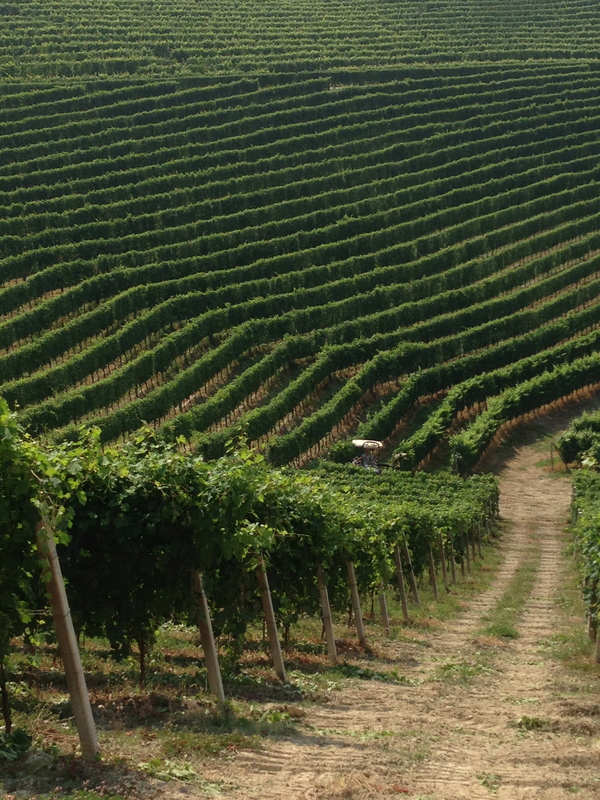 Produced in the borough of Diano d’Alba, hand harvested fruit and estate grown fruit. Harmonious, soft, round and fruity with hints of cassis, plum, violet, wild fruits and vanilla.“Tris” is bottled during the August following the grape harvest. This wine is harmonious, soft, round, lasting in taste and fruity, with a flavour of cassis, plum, violet and small wild fruits, mixed with a light final taste of vanilla.